If you read my blog post in June about the addition to the Tangle Library App and cursed loudly because you don't do i-anything, you own an Android, or you just really love the feel of real cards in your hands - curse no more! 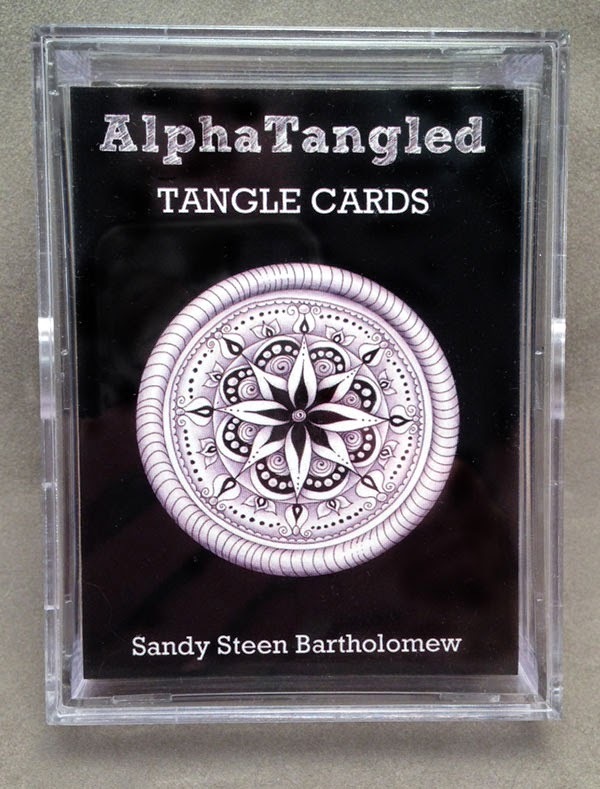 I am proud to announce a new collection... the AlphaTangled Tangle Cards! These cards were self-published and I can't tell you HOW EXCITED I was to open the box from the printer and spill out 50 smaller boxes all over the table... while Bonnie looked on in horror. I have a weird obsession with stacks of cards or new books... sigh. Whereas Bonnie was already thinking of how it would fall to her to sort out all the designs, (alphabetized of course), collate the cards into sets and fill all the boxes. Squeeeee! They look even lovelier stacked up in their little boxes! 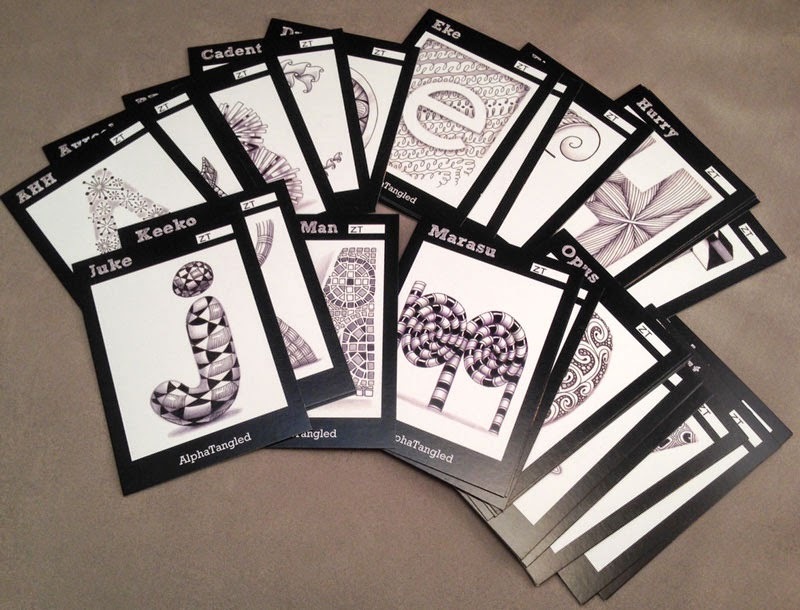 The AlphaTangled card collection has 40 tangle cards - all traditional Zentangle® patterns, a cover card, 3 blank template cards, and a card with a "prize" on it (sticker, tattoo or pin). They are all housed in a clear storage box. The cards are 2.5x3.5 inches, baseball/ATC sized. If you are into being super organized... Ahem... they can fit into baseball card sleeves in a binder. Or if you own all my other card packs already, you might like to sort them all together into categories like "borders," "backgrounds"... etc. On the fronts of all the cards, there is a little box in the upper right corner. This set has "ZT" pre-printed, but there is space to add your own code too. The previous sets of cards have an Index card and space to write out your codes. 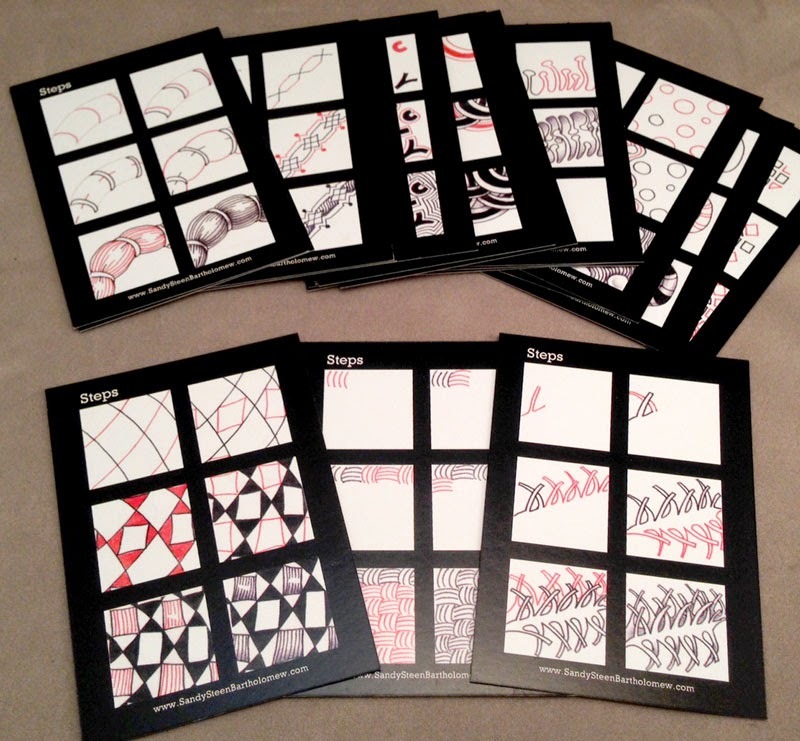 I use "ZT" to show all cards that are traditional Zentangle patterns. The only card in this pack that is repeated in another pack, is the "Zander" tangle. But this one shows a slight variation and has different art. When the first three packs of cards came out - a year ago! - I did a bunch of challenges with card packs as prizes. I think we should do that again to celebrate this pack too. Since I will be away on an adventure with my family, I will give an extended deadline. traditional tangle patterns to fill it in. You may interpret the challenge however you like, but stick to black, white and red, and shading, for your color palette. Any size. Post it to my studio Facebook page. I set up an AlphaTangle Album to make it easier to view all the art together. Deadline will be August 18th, so you have plenty of time. There will be two winners. One will be chosen by me (and Bonnie) and they will win a pack of the new cards and an AlphaTangle poster or an original AlphaTangle book (vintage, black cover). The second winner will be chosen by popular choice - the most "Likes" on Facebook - and they will win a new pack of cards and a copy of AlphaTangle with the red cover (Design Originals). 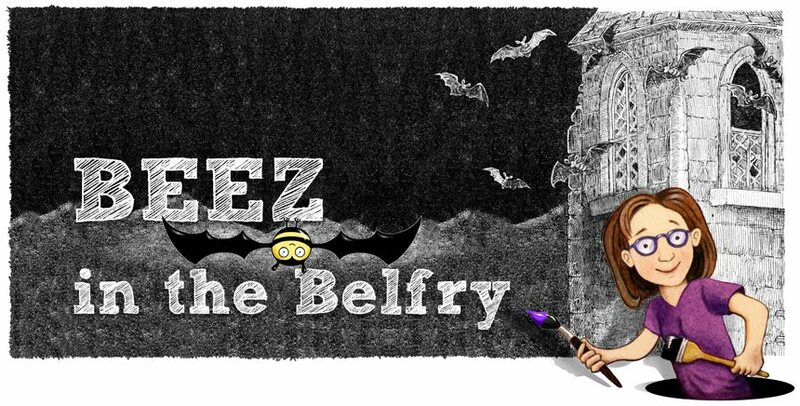 I will post all the entries here on the blog. If you want your AlphaTangled cards NOW, you can get them at my Etsy store, or on my website. All the other packs of cards, and the AlphaTangle books, are also available on those sites. These new cards are not available at wholesale, but the Totally Tangled, Yoga for Your Brain, and Kidz! Editions are available by contacting Judith McCabe at Fox Chapel Publishing. Last fall, on the way home from Bonnie's Zentangle certification seminar in Providence, we had the good fortune to visit the studio of my friend, and master childrens' book illustrator, Judith Moffatt! Her studio was charming and highly distracting as every inch was covered in pictures and framed artwork. She's illustrated a gazillion books using her distinctive cut-paper style illustrations and she teaches at RISD. We met at a childrens' book illustrators' art exhibit at Mill Brook Gallery about three years ago. Her art was cut-paper, my pieces were all Zentangle related. 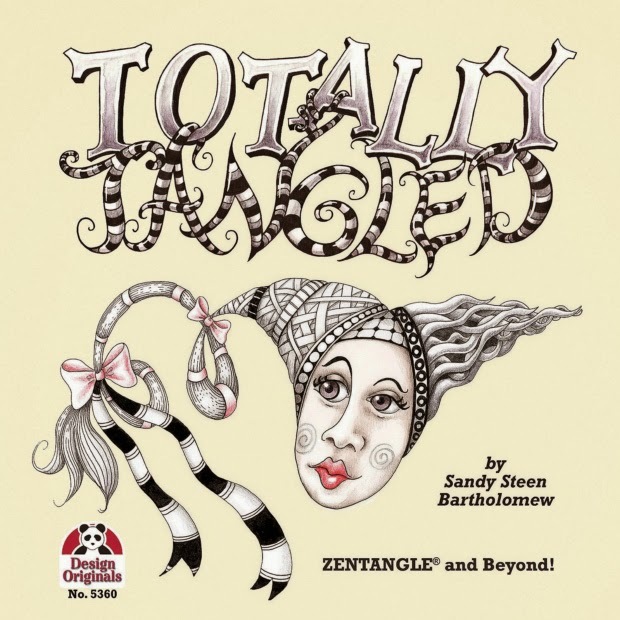 Our correspondence after that was all about Zentangle and I loved her resulting tangled images. So it shouldn't have been a surprise when we were seated on her studio couch, that she asked if we wanted to see her newest creations. 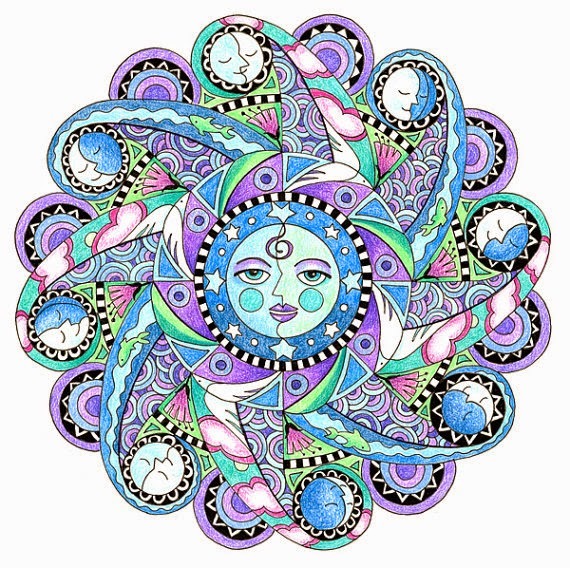 It's so hard to explain... we were surrounded by framed pages from her books... pieces of colored papers so tiny they had to be placed with tweezers... whimsical children playing... and she shows us these exquisite pen and ink mandalas with tangles and mermaids and flowers and birds...! Bonnie and I were gobsmacked into silence. Just the sound of drool dripping. (Ick.) But, seriously, these drawings were so beautiful we wanted to grab them and shout out to the world "Whoa!!" And Judy tells us they are her secret work and we can't say anything. 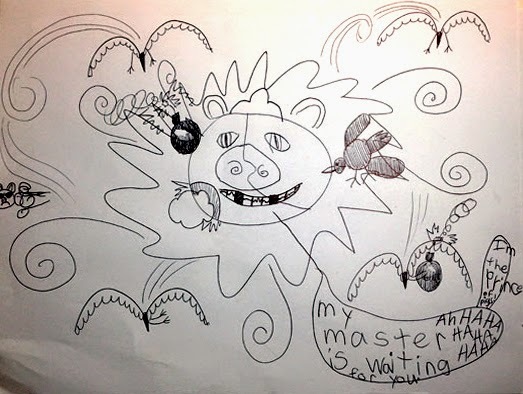 BUT, she is working on a coloring book with some of the drawings and she'll let us know when it's ready. And she sent me a copy to play with!! Lilah and I have spent the past three days, in our pajamas, coloring. 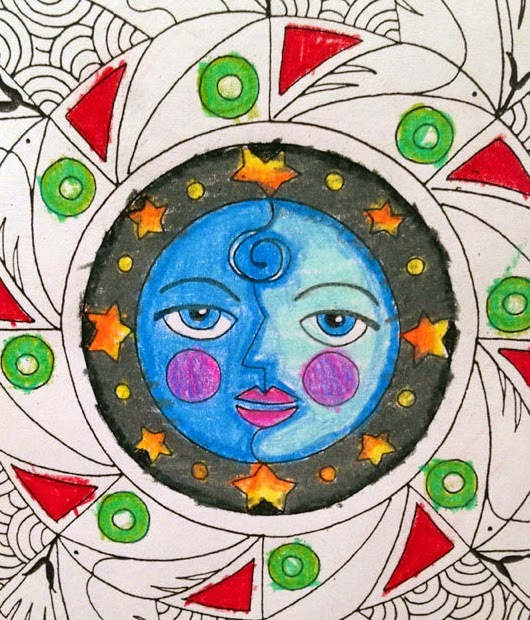 If you'd like to see our masterpieces and our review of the Mandala Coloring book, continue reading on after Judy's description and art. 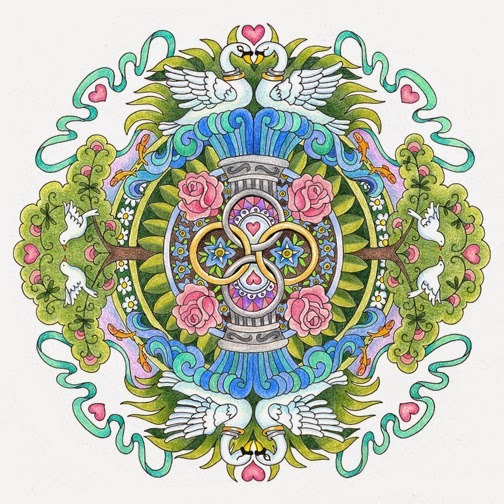 It took me a year to create the 9 Mandalas in this 20 page book. 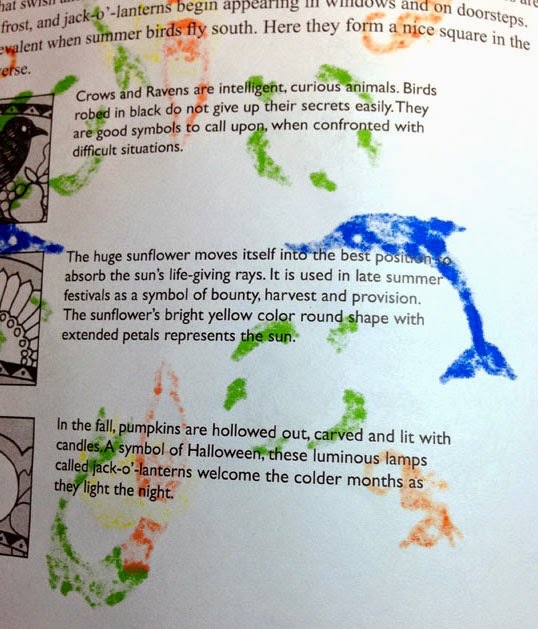 Each spread has an ink drawing of a Mandala on the right hand side, and a description of the inspiration for the Mandala with some of the symbolism explained on the left hand side. Two pages in the front teach about the best way to choose colors, what a Mandala is, and how I create my own type of Mandala. The front and backs of the cover are full color heavy stock (100 lb. paper) and the pages are a great quality white paper (80 lb.). Recommended for kids who have outgrown their juvenile coloring books to adults. A great way to relax. One tip I give my friends: if they are buying my book as a gift, include a package of Crayola twistable colored pencils. Pack of 18 only $2 at Target and they are pretty darn good! My moon Mandala is one of my favorites and the Loves Garden Mandala makes a great wedding gift (I also sell Giclee prints on Etsy). Judy's blog is a great place to learn more about her cut paper art and her current projects. If you are interested in seeing more, read on to see what Lilah and I discovered. If you like to use markers, I suggest you make a copy of the page to work on. 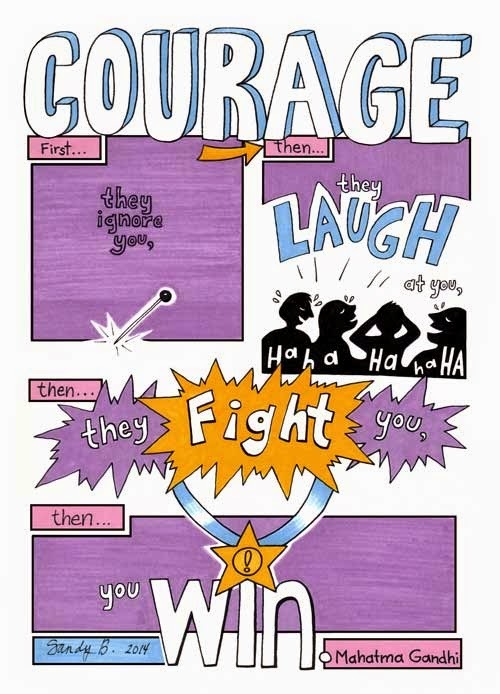 We ended up making a few copies of certain pages so that Lilah and I wouldn't fight over them! It is also a good idea to slide a clean sheet of paper under the drawing you are working on so that color from other pages doesn't get transferred to the back of the page. 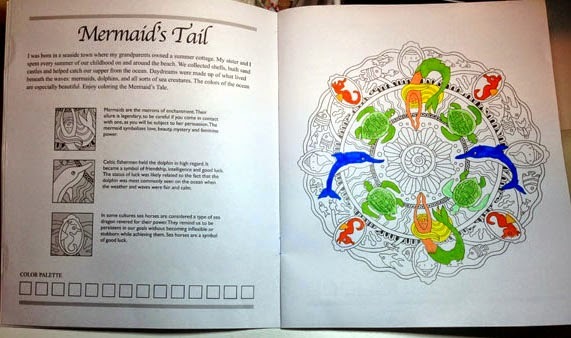 If you are planning on using the finished pieces as gifts - cut the pages out of the book before you start coloring. 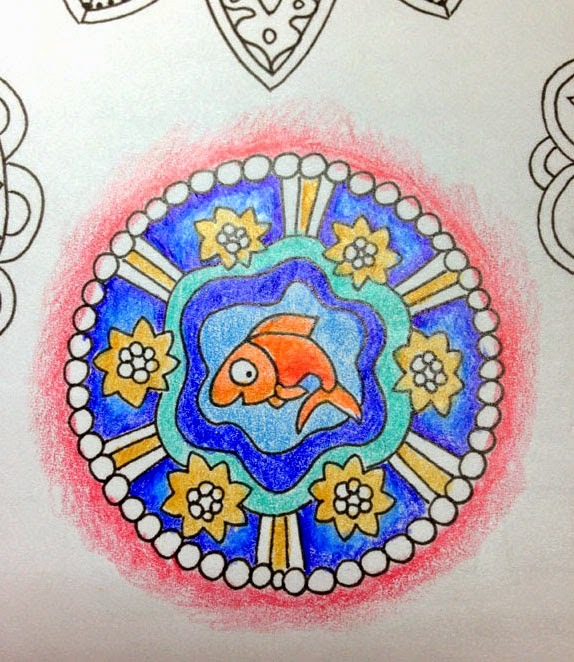 Colored pencils are the perfect medium for this paper - we used Prismacolors - and coloring was a dream. Keep the pencils nice and sharp so you can color the little details. 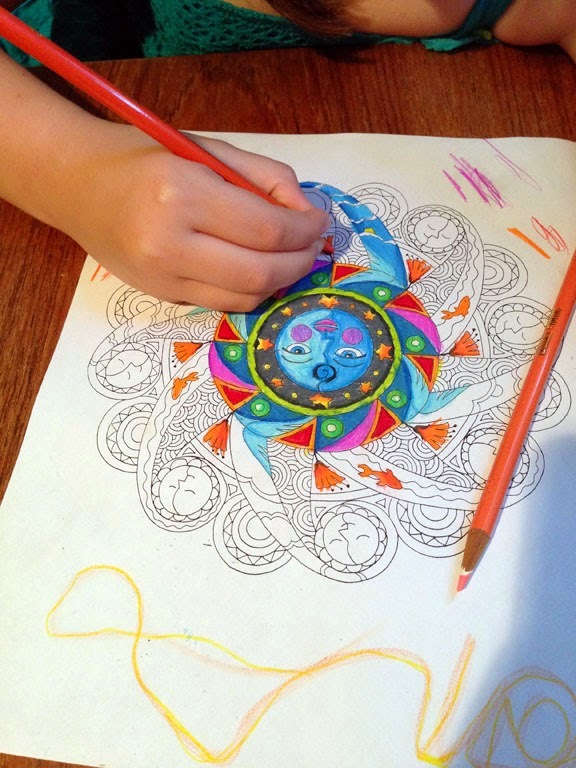 Lilah had a heavy hand with her application, but her color choices were inspiring. 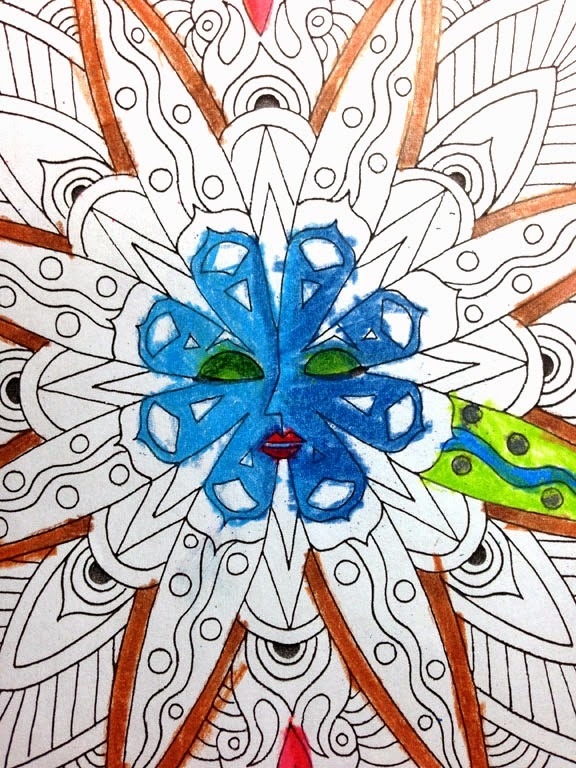 Rolling River mandala - colored by Lilah B. And she loved recording her choices on the color palette for each image. 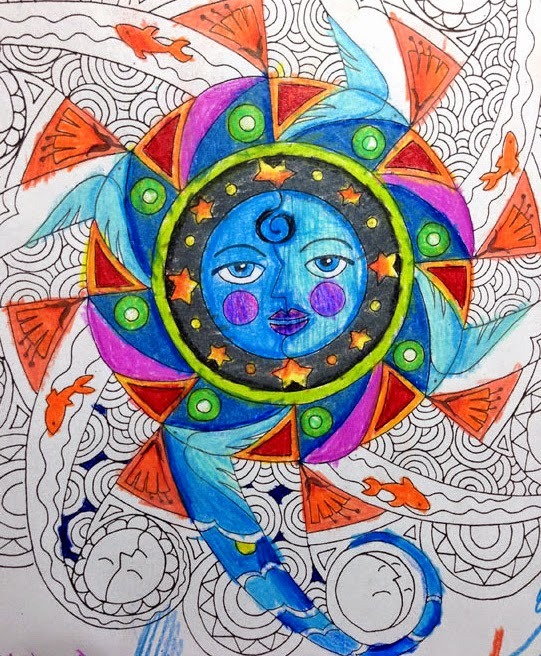 When she finished the piece, above, she looked over at the Sun mandala I was working on and made comparisons etc. between our works. I explained that I had been practicing all my life and had learned some little tricks. And how to outline an area with more pressure, then ease up in the center space (the orange face in the middle). And her favorite - how to blend two colors together! I start with a darker color, like orange on the fat end of the sun rays. It is darker (more pressure) at first, then I ease up as I spread into the ray. I go back over the whole section with a lighter color, like yellow, and blend it all together. I did the same thing on the blue rays - starting with a nice deep blue, then going back over with a light blue color, but pressing harder. Wow. That is quite a transformation! ... and knowing when to stop!! 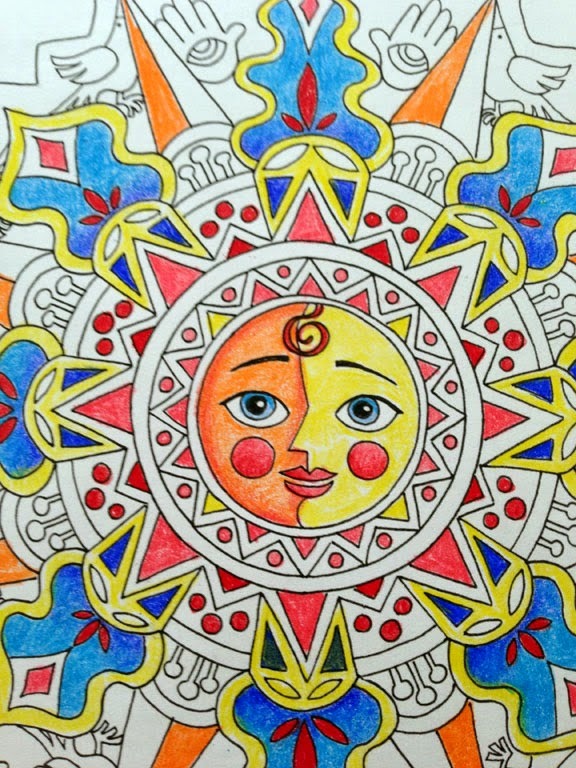 Did you know that it is OK to stop coloring, even if all the spaces aren't filled yet? I chose bright colors for mine. 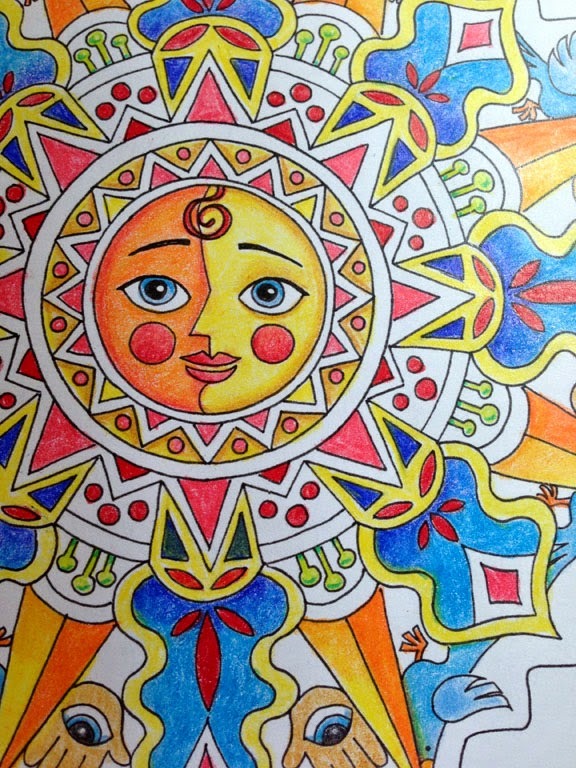 Sun mandala - colored by Sandy B. ...although I agreed that leaving some spots white looks very nice. 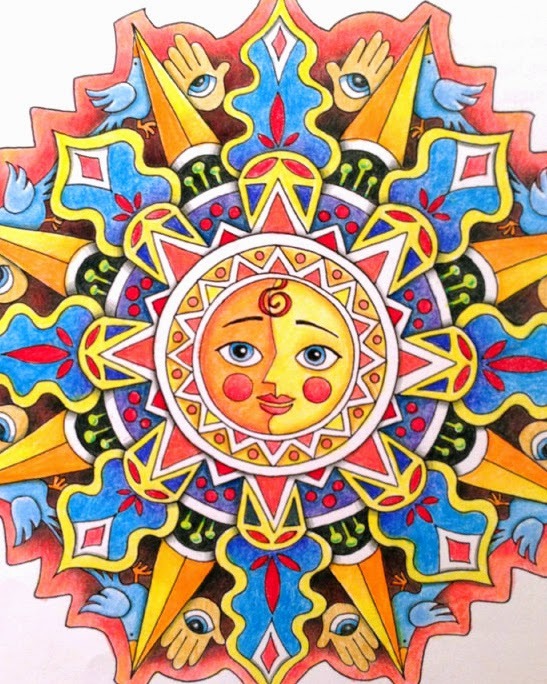 Sun-pig mandala-comic - by Sandy and Lilah B. And then we came home and colored some more! I picked the color palette - fearlessly. 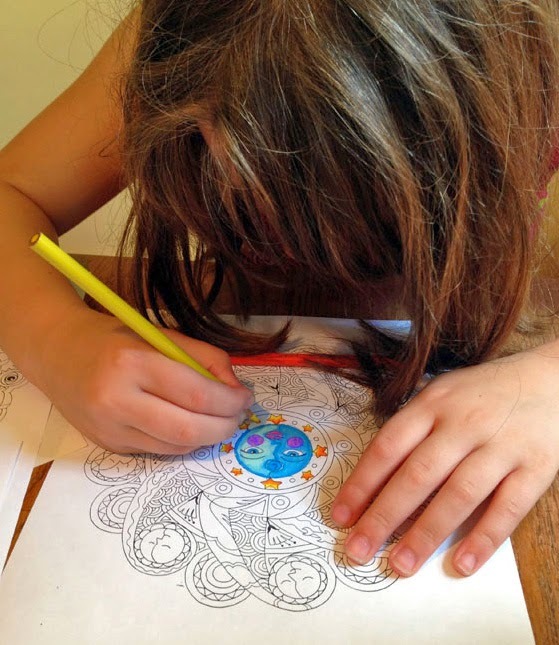 And Lilah decided we would each work on the Mother Nature mandala. 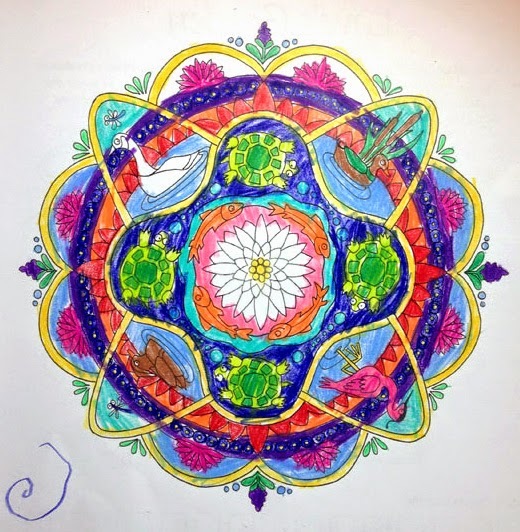 Mother Nature mandala - colored by Sandy B.
Oh - and one more useful tip! If you mount your finished mandala on black cardstock or black matboard, you won't see any shadows of text from the back of the page. 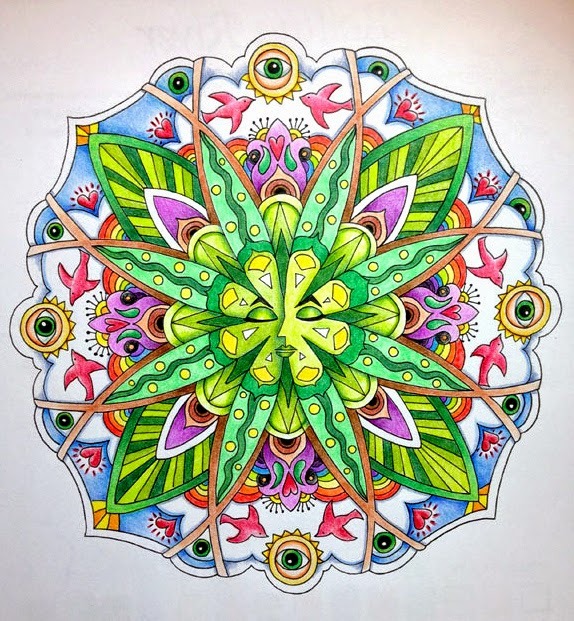 I plan to bring the book with us on our adventure next week - I still have seven more mandalas to color! 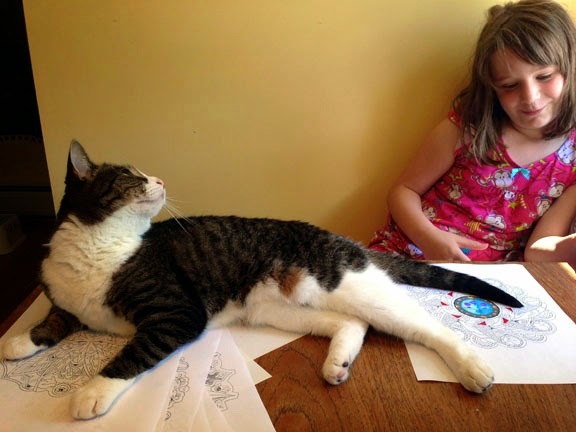 Minou and Lilah both find mandalas to be very relaxing. Here are my pages for Journal52 - I'm trying to keep up with July's and forgot to post June's! This is my favorite way to travel... by book. But that might just be because I have never gone first class. 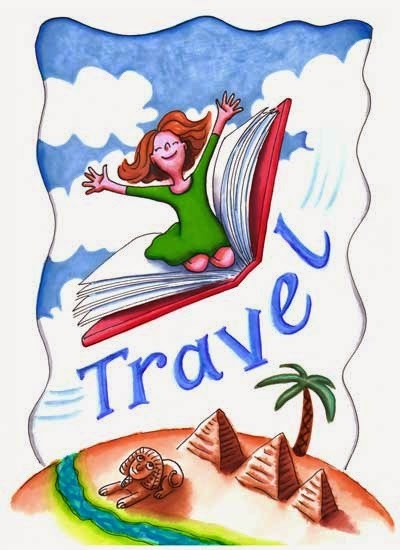 Next time I go to Egypt, I would love to see it from the luxury-travel point of view. I've been-there-done-that as "family trip," "archaeology student," and "tourists packed into a motorcoach." Maybe it's a bit shallow of me, but I want to know my salad hasn't been served to someone before me, and my mattress is 100% synthetic - not one bit of camel hair included! ;-) I don't mind get dusty and sweaty climbing through tombs and pyramids, but at the end of the day, I want a clean shower in a safe hotel. This drawing was done with a UniPin pen, Tombow and Koi markers, and a waterbrush. Passion... I am actually struggling with this very thing right now. I know when I am excited about something, but I can't seem to make a list of passions to help me decide what to focus on... So I did a journal page more on the topic of what "Passion" feels like to me. Parts are a bit muddy, but this is not meant to be negative - there's a lot of cool colors and patterns in there. 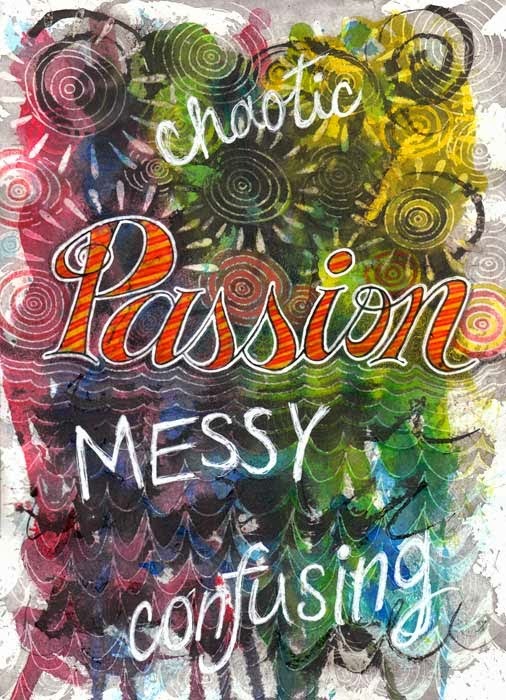 I used Tombow markers to draw the word "Passion," then coated it with a Gelly Glaze pen and drew all the designs with the Glaze pen too. Then I poured acrylic inks over it. Let it dry, drew more with the Glaze pen, added more ink. Finally, I drew the other words, and outlined "Passion" with a white Souffle pen. Seemed kind of symbolic since it started out nice and clean and pretty - and ended up looking like a mess. But that is what I had intended. And I realized that was the path of my entire marriage. And my divorce. Except for the actual legal part of the proceedings... we didn't "fight". And that's where I lost. I knew what was right, what I "should" do, but I lost my courage. I'm not sure why this popped into my head as a "comic" - maybe the irony? It's drawn with a UniPin pen and colored with Tombow markers. I guess life inspires art. I wasn't picturing anything for this prompt except pretty landscapes, etc. But I don't DO pretty landscapes. So I was stuck. Then one day, I had just returned home from an awful meeting and was trying to decide if I should just sit in my carport and cry? I didn't want to bring all my yuck-brain into my house. 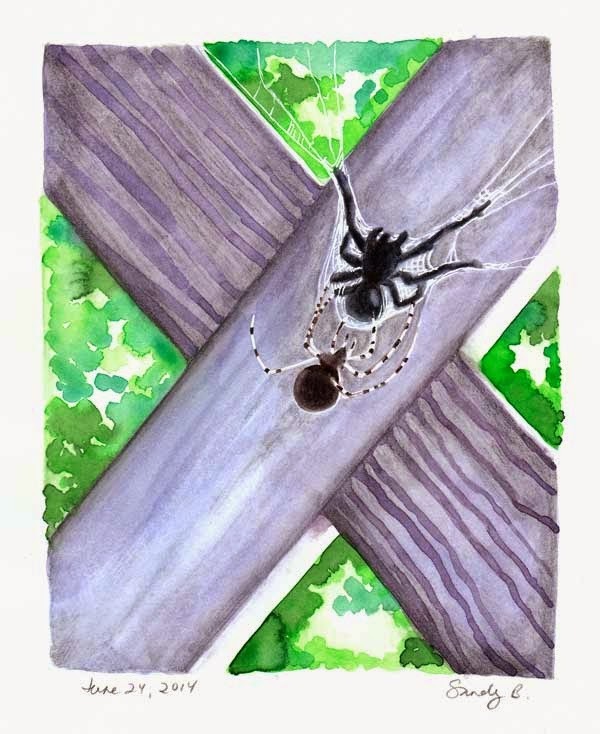 As I sat, I realized I was watching a very pretty spider wrap a much larger, very ugly spider, in her web. I was fascinated, and strangely encouraged. "If she can do it - I can do it." Plus... the image would work for this week's journal homework. Yeah! The whole piece is done in watercolors. I was going to say "No spiders were harmed in the making of this piece..." but, well... that's just not true. When I saw this week's prompt, I was SO excited! Since I had quite a bit of...assistance... with this piece, I thought I should include a piece I did on my own as well. 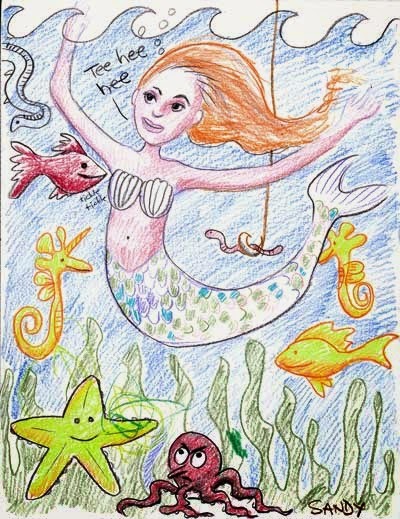 The day after the Mermaid fiesta, I drew this one with a Papermate ballpoint pen while my daughter tried, unsuccessfully, to displace all the water from the hotel pool! Wow - we are halfway through the year - how crazy is that? I'm hoping I can keep motivating myself to make these journal pages!